aerobd.news : Developed in conjunction with longtime technical partner Cosworth, the new naturally aspirated V12 was designed to represent the ultimate expression of the internal combustion engine. The resulting engine displaces 6.5 liters, and the 65° V12 sets exceptional new standards for maximum RPM and specific output with certified peak power of 1015ps (155ps/liter) at 10,500rpm, continuing to a maximum RPM of 11,100. Peak torque is 740Nm at 7,000rpm. With these peak outputs delivered purely by the ICE, the Valkyrie’s performance figures will be further boosted by a battery hybrid system, details of which will be revealed later in the development program. 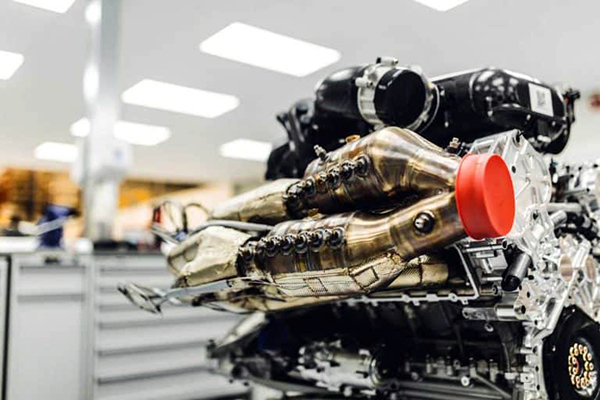 Cosworth’s F1 expertise is also evidenced in the Aston Martin Valkyrie engine’s weight. Given that the engine is a fully stressed element of the car and the level of technology in the combustion system, keeping weight down was a challenge for the company. Especially as use of extreme materiel alloys – which are so new that material properties over time are unproven – were actively avoided. Aside from the major castings – block, cylinder heads, sump and structural cam covers – the majority of the engine’s internal components are machined from solid material. These include titanium conrods and F1-spec pistons. Not only does this allow the use of material with ideal properties, but the ultra-fine machining process means greater consistency and components optimized for minimum mass and maximum strength. The result is an engine that weighs just 206kg. This comparatively low weight is due, in part, to component optimization. An example of this is the Valkyrie’s crankshaft, which is 50% lighter than the one used in the Aston Martin One-77’s V12. The manufacturing process for the billet-machined crankshaft takes six months. Starting life as a solid steel bar 170mm in diameter and 775mm long, it is first roughed out, then heat treated, finish machined, heat treated again, gear ground, final ground and super-finished. Upon completion, 80% of the original bar has been machined away. 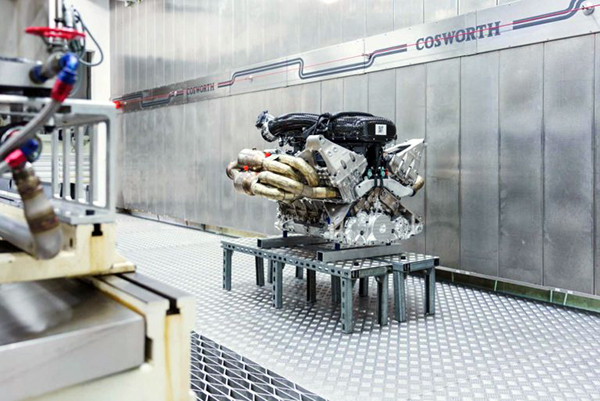 Bruce Wood, managing director at Cosworth, said, “Being asked to create a naturally aspirated V12 engine fit for what will surely be one of the most iconic cars of all time is an immense source of pride for Cosworth. “Decades in F1 taught us to expect a pretty demanding specification from someone with Adrian Newey’s unsurpassed track record, but when we started talking about specifics of power, weight, emissions compliance and durability combined with ever harder and sometimes conflicting targets, we knew this would be a challenge like no other.